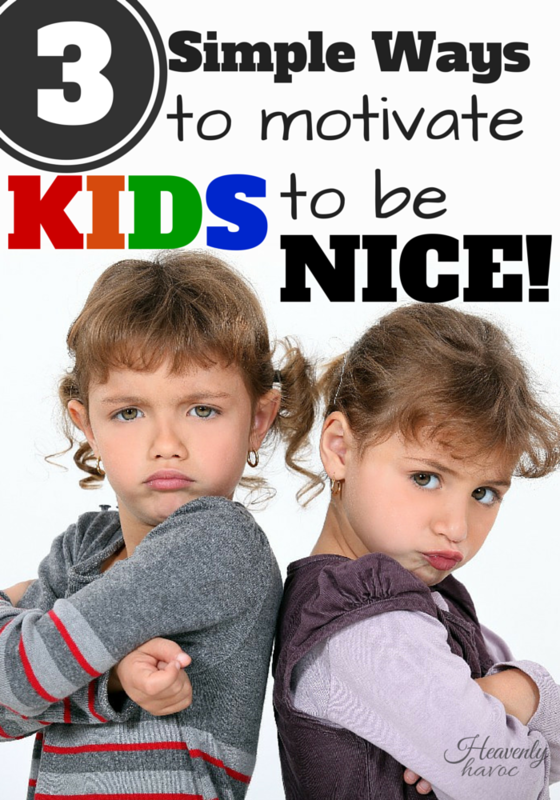 3 Simple Ways to Motivate Kids to be Nice! How to motivate kids to be nice! I’m so done with kids arguing and fighting. This happens every year. School gets out, and everyone is home again. It then takes several months for my kids to learn how to live with each other 24/7. By the time they adjust, it’s time to go back to school again! I’m done being the referee, I’m done with time-outs that don’t work. I’m tired of saying, “Knock it off!” over and over again when I know they aren’t listening! It’s time to pull out some new tricks. Actually, they aren’t new. They’re pretty old school. The important thing is, that they work better than time-outs. Time-outs require me to set a timer, and then monitor kids to make sure they don’t escape before it goes off. Not, that I don’t use that option too, but I’m ready for a change-up. I’ve used these before and I’ve already used this first trick today….twice. 1. Write a ‘LIST.’ At least that was what my mom called it. Whenever we were rude or mean or disrespectful, she would say, “Go write a list!” It was one of the most dreaded things at our house and we still joke about it as adults today. It’s great practice for writing and it makes them think twice before they utter the next unkind word! I took my plastic sleeves and hung them up in a convenient place where they are easy to access. 3. Serve Your Sibling. One of the best ways to learn how to get along with someone or, even better, to learn how to love them, is to SERVE them! I remember when I was a very young pre-school teacher still learning the ropes. One of the teachers that I was assigned to work with, drove me nuts! I was new and prideful and didn’t want anyone telling me what to do or how to do it and she was really good at those 2 things. I decided one day to take the advice my mother had given me as a kid to ‘serve my sibling.’ Obviously she wasn’t my sibling, but I knew the same principle applied. For the next month I did everything I could to serve her and I did everything she asked me to. End result: she is still one of my best friends today, 20 years later! I want my kids to be best friends with their siblings in 20 years too. Maybe someday they’ll write a blog post about how awesome their mom was for making them get along with their brothers and sisters. Maybe they’ll just hate me forever. Either way…it’s happening here at our house!